Ruthie Ridley of Ruthie Ridley Blog and her husband Ben were in need of new kitchen appliances for their home. We asked them to choose the best kitchen appliances for them. Read on to find out how easy their shopping and delivery experiences were. Ruthie, here! I am so excited to be sharing about my experience with The Home Depot and my kitchen appliances upgrade! Ben and I have been married for almost ten years now, and we have never bought new appliances for our kitchen. This was definitely a new and exciting experience for us! Unlike myself, Ben likes to do a lot of research. From reviews to pictures online to in-store and hands-on experience, a lot of thought and comparison happens before making any solid decisions for big purchases. Once we decided that we wanted a Samsung fridge and dishwasher, Ben began to narrow his choices down. I personally can appreciate the research online but have to be in the store, get my hands and eyes on things to see what I really want. On our day off, we went into the store and began looking at the appliances. Immediately, we were approached by one of their appliance specialists who was eager and available to help us make a decision! I began to explain to the gentleman that we had narrowed our decision down to a handful of appliances and needed to make a decision. We told him our top choices and he was able to tell us why our top choice was a good! All of a sudden I began feeling really confident about our decision. 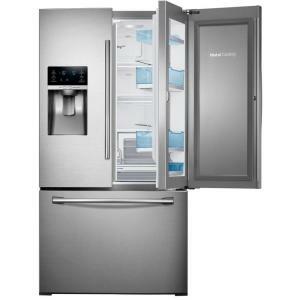 He listed amazing assets of our top refrigerator choice that made it easy for us to come to a conclusion. At this point we were pretty confident that we wanted the Samsung 27.8 cu. ft. showcase French door refrigerator in stainless steel… these were the features he listed off to us without hesitation or a notepad! I was impressed! As I mentioned before, this is our first time purchasing any big kitchen appliances so knowing these details was important. He was very honest in saying that the dishwasher we picked out was brand new and so the reviews were minimal; however, it had pretty much sold out, so that was a good sign! We settled on the 24 in. 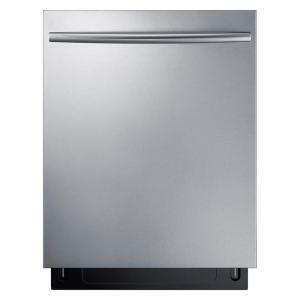 Samsung top control dishwasher! Our order was placed online. We received an automated phone call the day before our delivery stating that we would be getting receiving our items within a four-hour time period. Ben was off the following day and the delivery team happened to be in our neighborhood, so we got our appliances even sooner than expected! They were so kind to call and make sure we were home and could deliver! They came in effortlessly with our appliances and installed them for us as well! I was at work that day and when I came home, I screamed with excitement! The kids were in SHOCK! “We can get water and ice from the fridge now? !” Its the simple things! This process couldn’t have been any easier! I am so thankful for the knowledgeable staff in the appliance department as well as the wonderful team that delivered our new kitchen appliances safely and efficiently! We are in desperate need of a washer and I have no doubt that the process of purchase and delivery will be just as easy! Take a look at more Kitchen Ideas and How to Choose Appliances here on The Home Depot Blog. Follow our Kitchen Ideas & Inspiration board on Pinterest, too, for more small kitchen appliance ideas. And, browse The Home Depot’s online Kitchen Appliances.